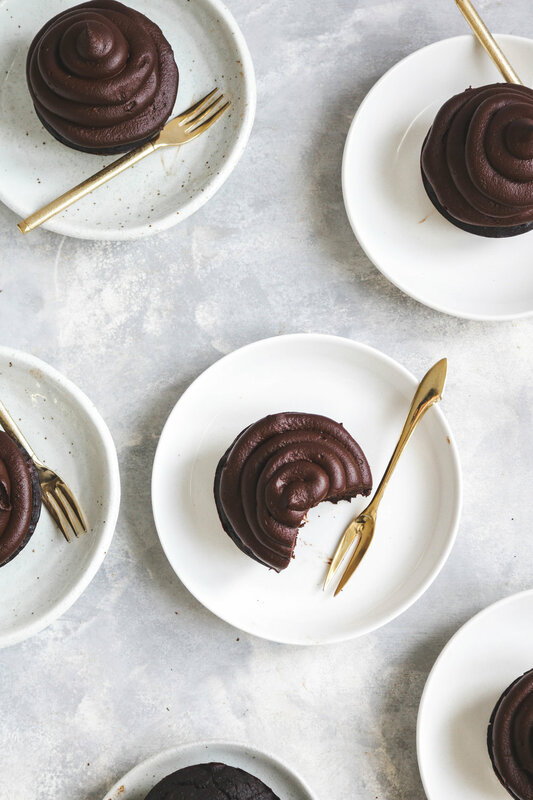 This Vegan Chocolate Cake is moist, rich in flavour and incredibly delicious... you won't believe it's made out of a vegetable: the eggplant! No flavours or textures compromised at all. All you need is 10 pantry staple ingredients to make this chocolate decadence. It’s here, it’s here! I’m so excited to finally share today’s recipe for the most delicious chocolate cake recipe- like ever. And this is crazy to me because it eggplant in it! Yup, you read that right. 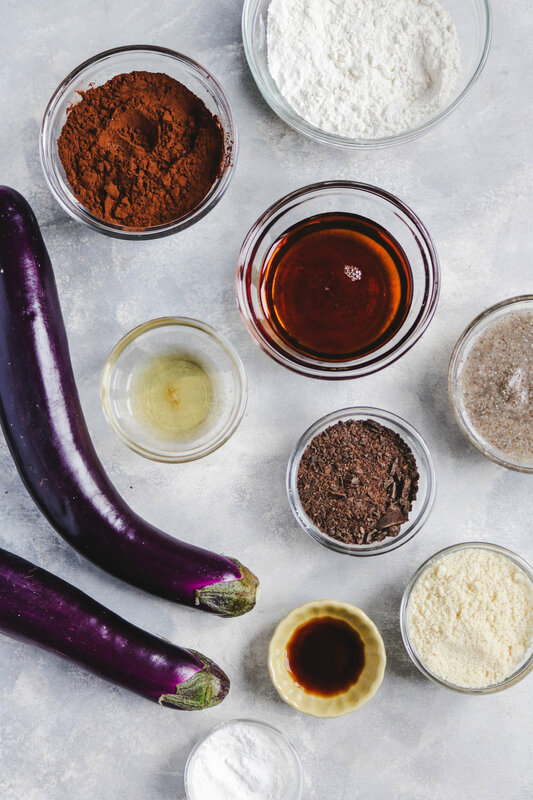 The main ingredient for this cake is eggplant. Only 10 ingredients used here, and you probably already have them in your pantry! And you can add some vanilla, instant coffee and salt for a hint more of flavour! The back end to the story of these Chocolate Cakes made with Eggplant: I was originally planning to make a chocolate cake using more a more common oil substitution that I think most of us know by now: apple sauce. I went digging for it in my pantry but I couldn’t find it anywhere and then I looked outside, basically a snow storm so going to the grocery store for one ingredient didn’t appeal to me too much. I looked around in my fridge and remember seeing zucchini the morning before, how about zucchini chocolate cake? Well, apparently my mom used it for dinner. Then I saw two beautiful purple eggplants in the back of the fridge, and then it hit me. Why not eggplant? If you can use sweet potatoes in brownies, zucchini in muffins, squashes and apples for baked goods… there’s hope. And I am so glad I went with this route because holy moly, it was one of the best chocolate cakes I’ve had (and I am not comparing this to vegan or healthy chocolate cakes, I mean like… ever). The eggplant gives it so much moisture, it makes it insanely rich. My mom is super picky when it comes to her desserts, and she absolutely LOVED this chocolate cake. If you love chocolate, you’re in for a treat. I have used both Globe eggplant and Japanese eggplant and have found the Japanese variety to be much more superior in terms of flavour and taste. The globe may leave bits of seeds (especially if not a high speed blender) and a much more bitter flavour. I highly recommend using the Japanese variety if you have access to it! I used a large 6 piece muffin tin for these cakes. I have not yet tried it with a smaller muffin tin or large cake tin so time in the oven may vary. For the larger cake tin, I would go with the 30 minutes and then check to see doneness with a tooth pick and add time as needed until it does come out clean. For smaller muffin tins, I would start with 25 minutes and check for doneness and add time as needed. These cakes are best served warm, but can also be made ahead! They’ll last 4 days in the fridge or can also be frozen. If you prefer a more CAKE-Y chocolate cake: substitute the maple syrup for coconut sugar and add an additional tbsp of cake flour (20g)! If you recreate these Vegan Chocolate Cakes made with Eggplant please share it and let me know what you think by tagging me on Instagram @lisakitahara, I love seeing all of your tasty recreations! Serve with chocolate frosting (or your favourite frosting recipe)!